The first step to using Build Machine is to create a GibbsCAM part which contains individual solids representing each axis and major component of the machine tool. This is an assembly of the components. 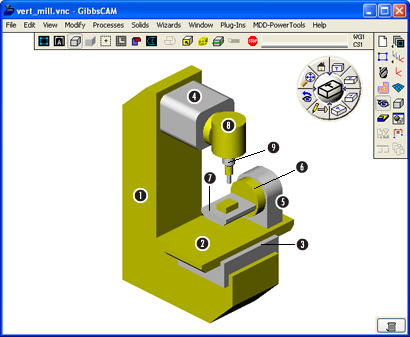 Note that the solids may be created in another CAD application and imported into GibbsCAM. An example of a machine tool assembly. For convenience, it is recommended that each body is given a descriptive name such as “Y_axis”, “Spindle” and “Table”. If a body will represent an axis, giving the body the name of the axis will make things easier when building the assembly of components. The origin for the machine model is very important as it is a reference for several values. A coordinate system must be created that represents the spindle or table face. The origin of the CS should be at the spindle face origin or the top-center of the table. The CS should be aligned as the machine is, i.e. if the machine is off vertical by 30 degrees, so should the Machine CS. This CS will be referred to as the “machine origin CS” throughout this document. 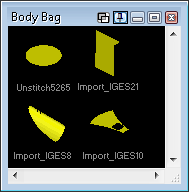 All of the bodies in the assembly must be assigned to this “machine origin” coordinate system. Example of a machine’s XY plane (A) and Machine CS plane (B) where the horizontal and vertical axes are shaded for emphasis. The Machine CS plane is used for alignment of bodies and for all reference values. Make sure to define the part origin at a location that is easy to identify on the machine tool, for example the center of the table or the spindle face for lathe-type machines. • The part model must be in millimeters. • For mill parts it is easiest to define the center of the table at the origin and then create the non-moving bodies. • For lathe, mill/turn and MTM setups it is easiest to define the spindle face at the origin and then create the non-moving bodies. • All bodies should lie in the same coordinate system, CS1 or ideally a CS that is aligned to the spindle face or table top. • Each moving part should be created in its home or “0” position. 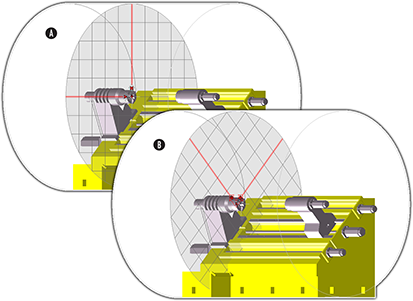 • Create Points and Lines to identify the center location and direction of the rotary axes. 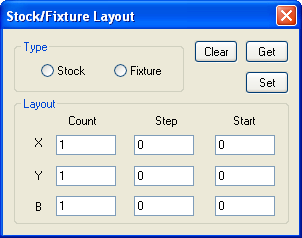 • Create a point identifying the tool attachment position. For a mill this is the spindle face, for a lathe this is the place on the turret where the tool holder attaches. 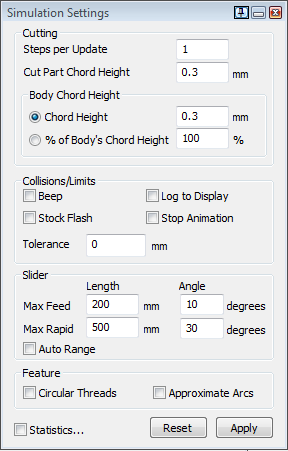 • When the MDD Editor setting Use Tool Holder Length is active the Z axis position will be corrected automatically during simulation to take in account tool/holder length and tool attachment position.